The affordable mini console with 30 classic titles pre-installed that ships with a controller similar to the original NES controller managed to record over than 1.5 million units sold. 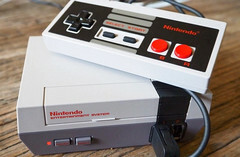 Nintendo Switch is coming soon, but until then, the Japanese company has another product on the market that sales like crazy, namely the NES Classic Edition mini gaming console. According to TechCrunch, "The company revealed that it has sold more than 1.5 million to date, a figure that probably could’ve been a lot higher — the retro reboot console was a hot holiday seller, and was consistently unavailable despite immense demand." In addition to the above, it looks like even now, more than a month after the end of the holiday shopping season, finding the NES Classic Edition in stock is quite a challenge. The same source mentiones that Amazon, GameStop, and Best Buy show the console as out of stock. As it usually happens in such cases, a few Amazon resellers have the NES Classic Edition up for sale starting around $129 USD, while the usual price is half of that amount. The mini console is very easy to use, offering HDMI out connectivity, using USB power, and shipping with a single controller and 30 pre-installed games.